that nothing else has ever approached and that only another runner could understand." Over the last few months I've done a lot of reminiscing about my 30-year running "career." Most of this retrospection has been positive: wonderful memories of friends I've made from all over the USA and several foreign countries, challenges I've overcome, goals I've successfully achieved, important life lessons I've learned, beautiful places I never would have seen if it hadn't been for running. Taking up the sport of running has been one of the best things I ever did for myself. It has enhanced and enriched my life in so many positive ways -- physically, mentally, emotionally, socially. Once I started running I discovered fairly quickly that I was "born to run." As my stamina gradually improved and I was able to run farther and farther, I began to look forward to each run. Before I knew it, I was totally hooked. 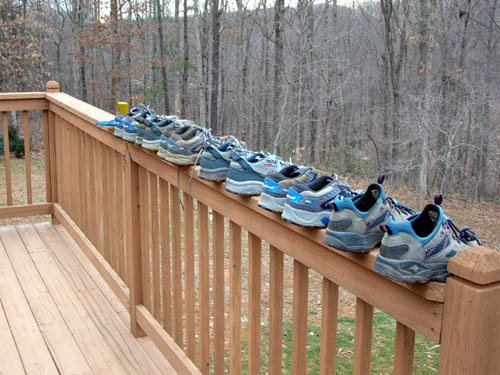 I'll always remember a conversation my ex-husband and I had in the early years of my running. (This is the totally non-athletic, very tolerant man who spent the first two decades of my running career with me, poor fella!.) We were talking about other peoples' addictions to drugs or alcohol or something and I too self-righteously made the remark, "I'm glad I'm not addicted to anything!" He about choked on whatever he was eating or drinking and exclaimed, "You're addicted to running!!" He was absolutely right. I was not even aware of the extent to which running had taken over my life, but to the hapless person married to me at the time it was quite obvious. Years later we divorced amicably because our lifestyles and goals had become so very different. Thank goodness I chose not to have any children or they would have been neglected, too! I often felt that "ultimate aliveness and transcendence over body and mind" that Heinreich so eloquently describes in the quote above. There is nothing in this world that compares to the feeling I get when I run. I fear it will be very difficult to duplicate with any other sport I'm able to do in the future with bad knees. On top of the world; it doesn't get any better than this! There is also nothing like the feeling of setting a challenging goal, working hard to achieve it, and finding success. I learned the basics from my parents: determine what you want, then figure out the best way to get there. Set high standards for yourself. Don't be afraid to "fail;" learn from your failures. Build on your successes. I tried to put those principles to good use in my life, including my running. Success breeds more success. With each goal I achieved, I gained self-confidence. Faster times, longer distances, more difficult terrain. 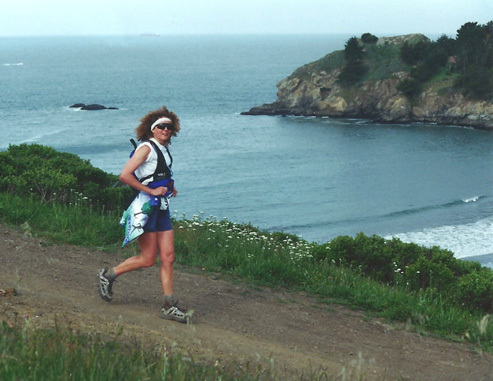 By the time I ran my first ultra marathon in 1992 at the age of 43 -- the difficult Mountain Masochist 50-miler, below, which is really more like 53 or 54 miles -- I felt like I could accomplish anything I ever wanted. After completing a hundred miles the first time, well, I felt almost invincible and that carried over to other aspects of my life. I only hope I wasn't too insufferable! There's a fine line between self-confident and cocky. Running has been a great teacher for the past thirty years. I've gotten a continuous education not only from other runners but also from my own experiences in the sport. I wouldn't trade those experiences for anything. I have to admit to some regrets about my running "career," too. 1) I regret that it's over!!!! That probably isn't what you thought I meant, is it? < grin > OK, I'll get serious. 2) I let running fuel my already-competitive nature a little too much. I was seldom completely satisfied with my race times, even road PRs. I always thought I could do better and boy, did I try! When I was unable after repeated attempts to shave another five minutes off my marathon time to get that elusive sub 3-hour time, I turned to ultra running for a completely different kind of challenge. It was hard to be a "has been," no longer as fast as I used to be. I'd built a reputation in the Southeast as consistently winning or placing in my age group at road races and now I was slowing down, not always coming home with an award. Of course, probably no one else thought of me as a "has been" but I did -- and I have always been my own worst critic. I figured I'd put less pressure on myself when I started running ultras. I vowed to never run the same race twice, in order to avoid the stress of trying to do better the next time. That didn't last long. I loved some of the races so much that I had to go back repeatedly. After several years of ultra-distance PRs those began to fade, too, as I aged and continued to get slower. 3) That leads to another regret -- that I didn't get into ultra running at an earlier age a) so I could have enjoyed it longer and b) so I would have been more competitive in those races. Ironically, being too competitive has been a two-edged sword for me: I just admitted it is one of my regrets! In addition, more years of ultra running may have brought me to this bone-on-bone condition in my knees at an even younger age. The jury's still out on that one. Focusing on ultra-distance trail running and races in my 40s and 50s was a wise choice for me in many ways. I loved challenging myself with greater and greater distances and found a completely different atmosphere in the ultra community. 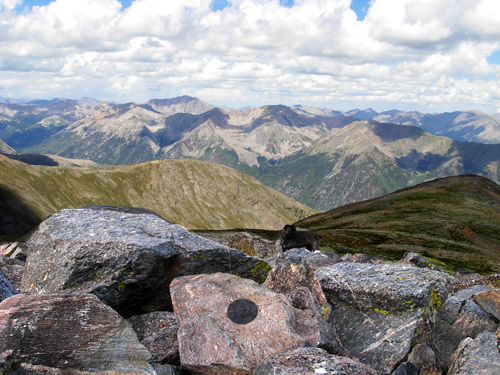 The emphasis was more on competing against the terrain, distance, and elements than each other. Even the last finishers (heck, even the runners who don't finish but have the guts to start such races!) earn respect from their ultra running peers. Wild & Scenic 100-miler. We both DNF'd but, by gosh, we tried! It's a wonder I love trail running so much. Although I am definitely built physically and wired mentally for running, I have always been a klutz on trails, constantly tripping over rocks and roots and falling down. Jim says I don't pick my feet up high enough. I also believe I don't have the greatest sense of balance in the world. That was especially true after I ruptured the peroneal brevis and longus tendons in my left ankle in 2001. My proprioception has never been the same since then -- and I've got the scars on my arms and legs to prove it. 4) It's also a wonder I've kept at this running game for thirty years when you consider how much of that time I have been injured and unable to run for several days to several weeks at a time. I've probably spent more money on injury prevention, diagnosis, surgery, and treatment than I have on running gear and races! I don't regret that I kept on running; I just regret that I got injured so often! Each time I was injured I got a little taste of what it was like to not be able to run. I always assumed I'd heal and be able to resume running but those downtimes were tough. I missed my running "fix." None of the cross-training I'd do (pool running, cycling, walking, snowshoeing, elliptical machine, stair-stepper, weight machines, etc.) did for me what running did for me, either physically or psychologically. And I'd worry about what it would be like when I was finally forced to give up running. 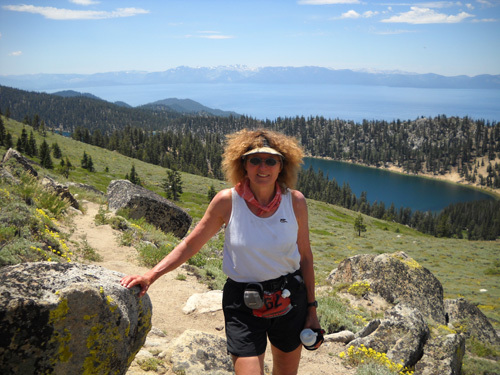 Not a total has-been; I won the F60+ AG award at the Tahoe Rim Trail 50K last July. Eventually I became a "has been" in ultras, too, unable to run fast enough to beat the cut-offs in many of the difficult mountainous races I loved so much. I found my redemption in journey runs and fixed-time races, where the focus was on distance more than time. Distance has always come more easily to me than speed. 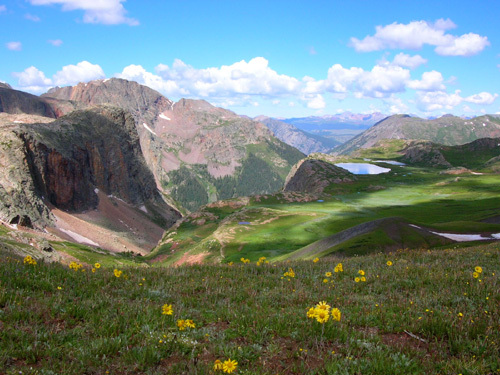 I loved being able to spend massive amounts of time outdoors in the woods and mountains, sometimes seeing fantastic scenery in one day that it would take several days for a hiker or back-packer to see. I regret I wasn't able to do even more of that, now that I'm one of those hikers and can't get as far as fast I used to be able to do. 4) I even have a couple regrets about my Appalachian Trail Adventure Run. One is that I didn't do it when I was considerably younger! I sure wanted to, but it wasn't practical career-wise until both Jim and I were retired. 5) My other regret is that I didn't take more time to complete my AT journey run, which was more of a hike than a run because of the difficult terrain. 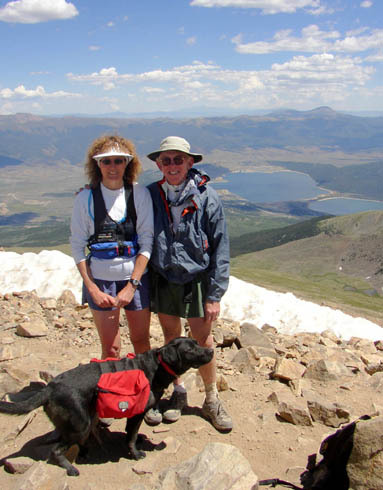 I started off with a half-hearted goal of trying to set a new female "record" on the AT and quickly found out that's not realistic for an arthritic 56-year-old woman who usually didn't run and walk 2,175 miles in a year, let alone three or four months! Full of hope on Day 1 of our personal Appalachian Trail Adventure Run (4-30-05). Once that was clear, I wish I'd taken more time to enjoy being both on and off the Trail. Jim regrets pushing me so hard, too, but we were both concerned about the mounting campground costs and being away from our house for so long (it was the first time we'd left it for several months at a time). If we had it to do all over again, we wouldn't have gotten that house a year before the AT trek. We could have enjoyed living full time in our RV and spending as much time along the Trail as we wanted. < sigh > Live and learn. 6) I'm sure some folks are wondering if I regret running as many miles as I have in thirty years -- because of my knee deterioration. My answer is an emphatic NO! I do not regret any one of the thousands of miles I have run. In fact, I wish I had run more. I wish I'd started when I was younger. Based on my research about arthritis and what several orthopedists have told me, my problem is caused more by genetics than excessive running. I have absolutely no regrets in that regard about the running. And yes, I realize I might sing a different tune when I'm recovering after knee surgery! Meanwhile, that's my story and I'm sticking to it . . .
< sigh > Someday I may share with you the pre-running list of things I wanted to accomplish before the ripe old age of 30, some of which I'm not likely to attain in this lifetime -- mostly because I'm not as fearless as I was in my 20s when I composed that particular list. Despite those regrets and some unmet goals, I do have a good number of running achievements to be proud of. I'll be a happier "former runner" if I can remember more of what I accomplished than what I didn't accomplish! I started to run to lose weight and it brought me so many other rewards that I continued running for thirty years. I stopped running only because of physical limitations, not because I lost interest in the activity. I fairly quickly lost the excess pounds that prompted me to start running and have kept my weight at a healthy level into my 60s. Because of running and other healthy habits I have strong bones, a very low resting heart rate and respiratory rate, moderately low cholesterol, and a host of other physical markers of a much younger woman. 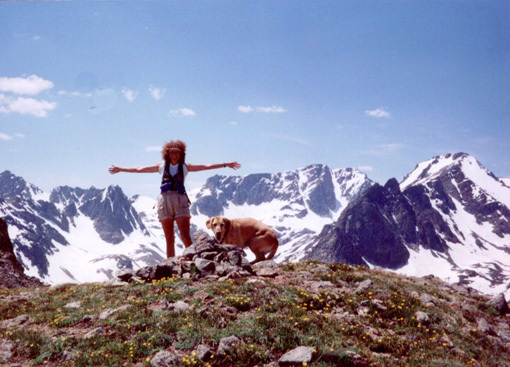 I progressed from being unable to run to the end of my street (a quarter mile) to being able to run and walk 100 mountainous trail miles in 28� hours. Although I DNF'd nine 100-milers, I was able to finish both Arkansas Traveler (1999 at age 50) and Vermont (2000 at age 51). 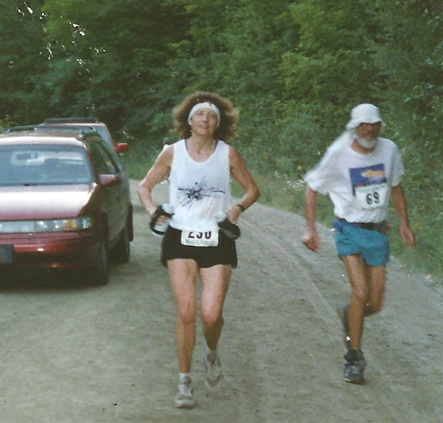 My first 100-miler, Vermont in 1998 (age 49). Aaron Goldman is one the right. This photo is ~ 68 miles. I dropped out with hamburger feet at ~ 83 miles but almost felt like I'd won the race! I have PRs that make me much prouder now than they did when I set them: among them are a sub-19 5K, several sub-40 10Ks, two 1:27 half marathons (Philly), a 3:05 marathon at Shamrock (all those PRs on roads were on certified courses), an 8:20 50-miler (LeGrizz), two 28�-hour 100-milers in my early 50s, and an 82-mile 24-hour race (Across the Years) that I mostly walked at age 59. 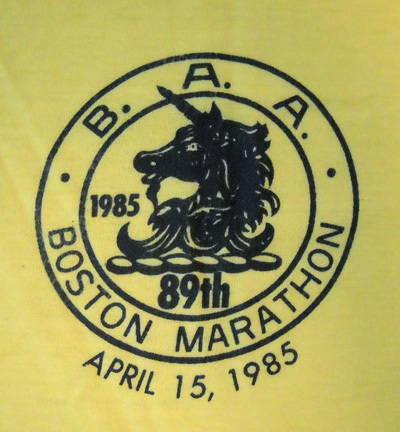 I qualified for the prestigious Boston Marathon the last year (1985) before the standards were made easier. It took several attempts to get under a 3:20. I blew away my PR at Boston; it remains my second-fastest marathon. That shirt is a keeper! I was fast enough in my early masters (40+) years to win money in about a dozen road races in the Southeast, a total of about $1,100. Race fees, transportation, and other costs were higher than that, of course, but that's not the point . . .
my first Labs, were little pups. A year later, we won the 1- and 2-mile dog races (first female). 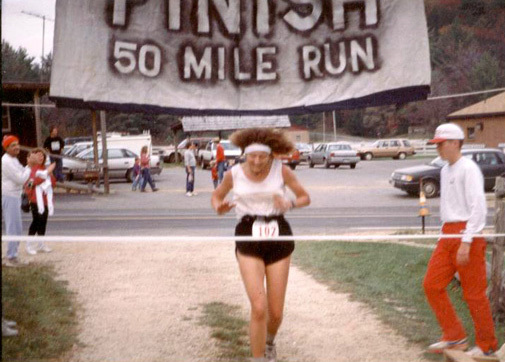 I earned the most female and/or overall points in the Run & See Georgia race series in 1989, 1990, and 1991, running road races nearly every weekend from 5K to the marathon distance. One year I ran about 60 races! 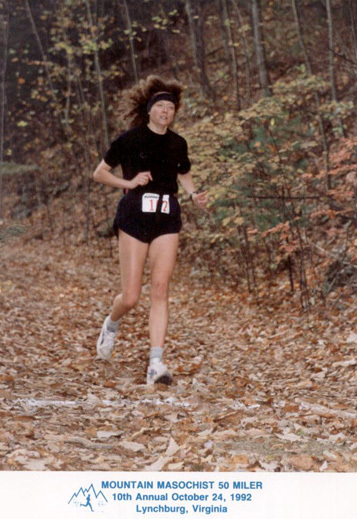 I chose one of the hardest trail 50-milers in existence at the time as my first attempt at racing over the marathon distance (Mountain Masochist, 1992) -- and came in 3rd female at age 43. MMTR intrigued me and I didn't even consider doing a 50K first. 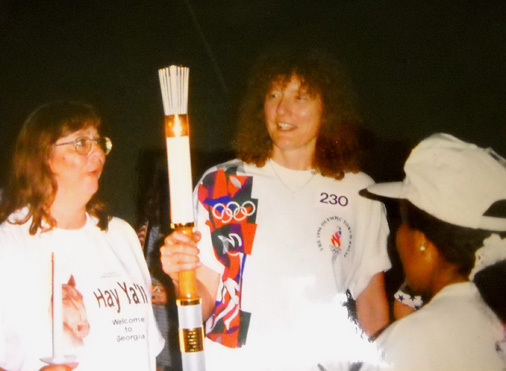 I was chosen to carry the Olympic torch the night before the opening ceremonies for the 1996 Summer Olympics in Atlanta (next photo). I was also chosen to be a volunteer every day during the Games because of my extensive service to the Atlanta Track Club and other community organizations. I was voted to be on the Atlanta Track Club Board of Directors for three years in the late 1990s. At that time, the club had over 10,000 members. I ran so many races and was in so many race results, I had high name recognition! 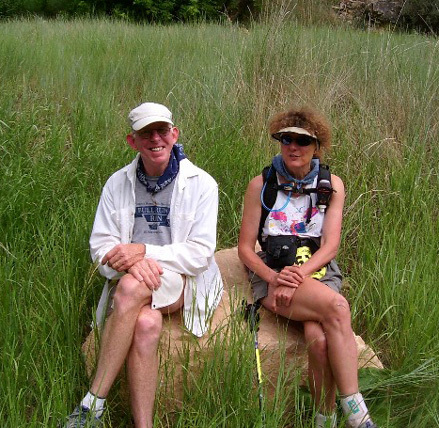 I ran and walked all of the Colorado Trail in disjointed segments when I was 57-58 years old. 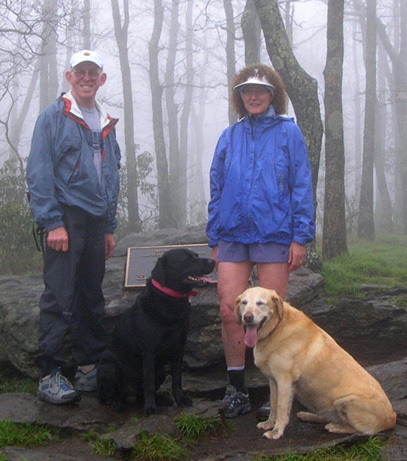 The athletic achievement that I consider the most difficult and satisfying is running/hiking the entire Appalachian Trail (2,175 miles) in 2005 as an arthritic 56-year-old female. It had been my dream since I was in college. I could not have done it without Jim's outstanding crewing and support. 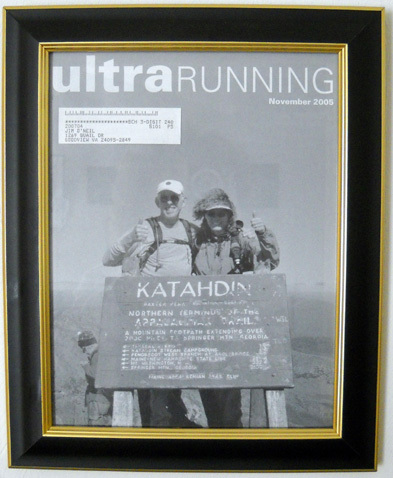 And we never dreamed that achievement would land us on the cover of the November, 2005 issue of UltraRunning Magazine!! Thank you, Don Allison, for that "15 Minutes of Fame." It doesn't matter if they are no longer able to run -- ask people who have spent half of their lives engrossed in the sport of running and they will tell you it is so much more than a sport; it is a way of life and it's not easy to give it up. In my heart, I'll be a runner until the day I die. When Dr. Johnson told me in September that I'm bone-on-bone in both knees and I knew my 30-year running "career" was on its last legs, so to speak, I plaintively told Jim to please understand that when I say "I'm going out for a run" I'll most likely be walking, not running. Habits are hard to break. After that many years I'm so used to saying "going for a run" that it's hard to remember to now say "going for a walk." It's not denial any more, just a matter of reprogramming a brain that's hard-wired to think in terms of running. My alter ego thinks I can still fly like I did when I was 40 . . . I still consider myself a runner. In fact, I still occasionally do some uphill running to get my heart rate up during a walk. I fear losing the fitness I've worked so hard to attain more than I fear losing my identity as a runner. But don't be surprised if you hear me refer to myself as "a runner" long into the future. That identity may fade with time, but I can't guarantee it. Next entry: if not running, what will drive the Next Third of my life?